S'Algar ,is located on the South East corner of Menorca, a 20 minute drive from Mahon airport. 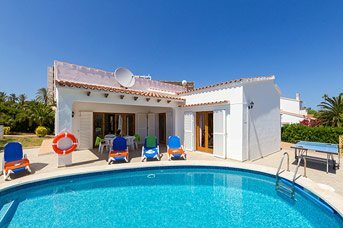 An attractive, well established holiday centre on the rocky coast between Mahon harbour and the lovely fishing village of Cala Alcaufar, S'Algar is a great favourite with ,British holiday makers. There are 2 hotels for some evening entertainment. There is no beach as such, just a small stretch of sand but most people prefer to sunbathe on the many rocky platforms that adorn the coast, many with steps leading into the water. A little further along the coast is the resort centre of S'Algar, with several shops, a supermarket and a variety of bars and restaurants lining the paved walkways. The children will love the road train which regularly trundles around the resort. S'Algar is also a great favourite for watersport enthusiasts as the waters are clear and enticing, particularly good for scuba diving and snorkeling. The diving centre is PADI and RYA approved and will care for both the initiated and beginners providing equipment hire with tuition also available. The sporting facilities at S'Algar are possibly the best in Menorca. There is something for everyone including tennis courts, a bowling green and a mini golf course. The more adventurous can hire a powerboat or try their hand at parascending. 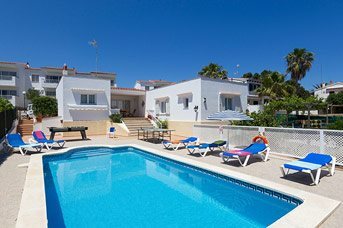 S'Algar ,is located on the South East corner of Menorca, a 20 minute drive from Mahon airport. 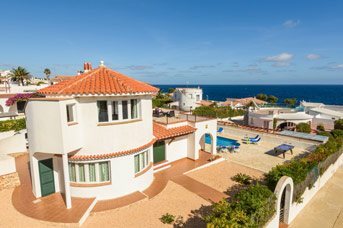 An attractive, well established holiday centre on the rocky coast between Mahon harbour and the lovely fishing village of Cala Alcaufar, S'Algar is a great favourite with British holiday makers. There is no beach as such, just a small stretch of sand but most people prefer to sunbathe on the many rocky platforms that adorn the coast, many with steps leading into the water. A little further along the coast is the resort centre of S'Algar, with several shops, a supermarket and a variety of bars and restaurants lining the paved walkways. Two hotels have a variety of evening entertainment. The children will love the road train which regularly trundles around the resort. S'Algar is also a great favourite for watersport enthusiasts as the waters are clear and enticing, particularly good for scuba diving and snorkelling. The diving centre is PADI and RYA approved and will care for both the initiated and beginners providing equipment hire with tuition also available. The sporting facilities at S'Algar are possibly the best in Menorca. There is something for everyone including tennis courts, a bowling green and a mini golf course. The more adventurous can hire a powerboat or try their hand at parascending.